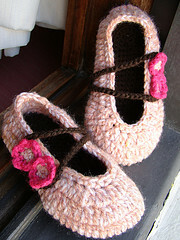 Just because I’m posting a picture of the cutest little baby girl slippers ever, it doesn’t mean I’m hoping for a niece. However, it does mean that my sister called with news that she’s expecting; and I couldn’t be more thrilled! Let this be a testament to my ability to keep secrets. I hate it, but I CAN do it. Thank goodness I can tell the world, now. MY SISTER IS PREGNANT!!! Hooray! You and your vault are awesome! Hayes suggested that we name the baby Christopher Hayes. Original, huh? How FUNNY! I mentioned to Matthew this morning that Aunt Amy had a baby growing in her belly and that Hayes was going to have a baby brother or sister. Matthew responded with “I want a little sister”…I said “why do you want a little sister?”…Matthew said “so that I can name her Matthew”! Hayes and Matthew are truly two peas in a pod! Congratulations! “A Sister Named Matthew” That sounds like a book title, no? and WOW. those *are* the cutest little baby girl slippers EVER!